Jack Merwin with the 13-foot Burmese python he caught near Alligator Alley. 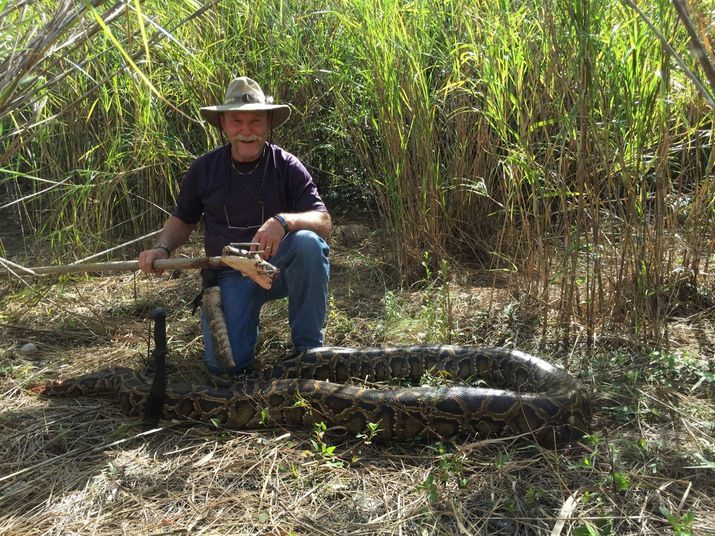 (CBS News) – Hundreds of people are taking part in a month-long “Python Challenge” in the Florida Everglades, hunting for Burmese pythons. While the species is not venomous, the snakes are strong and deadly, and can also threaten the ecosystem, reports CBS News correspondent Mark Strassmann. In the Florida Everglades, it is “basking season” for Burmese pythons when the cold-blooded snakes seek out the warmth of the sun. Tom Rahill’s team is hunting for these snakes. Burmese pythons are not a venomous, but they are an invasive species – and an evasive one. “It is a challenge. And we’ll go multiple days and not see anything,” said Tom Aycock, a member of Rahill’s team. “I’ve supervised hundreds and hundreds of captures and over 300 captured personally,” Rahill said. Rahill tracked down his first Burmese in 2008 and was hooked. “You go into an alpha predator mindset. If you don’t have an alpha predator mindset, some people can get hurt easily,” Rahill said. Big Burmese can also coil and crush you. “I had a hold of a 17-foot python a number of years back. Totally ecstatic… I had a hold of it and it moved me like I was a feather on a freight train,” Rahill said. The Burmese python isn’t venomous, but the non-native species is destroying the native wildlife in Florida’s Everglades. A big Burmese can even swallow a deer. As captured in one photo, an alligator inside the python’s stomach was so big, the snake actually exploded. Like the population of these snakes in the Everglades, a female can lay up to 100 eggs. “There could be tens of thousands to hundreds of thousands of snakes. We just don’t know,” said Kristen Penny Sommers who works for the Florida Conservation Commission. Some experts believe pet owners released their Burmese into the wild when the snakes grew too big. 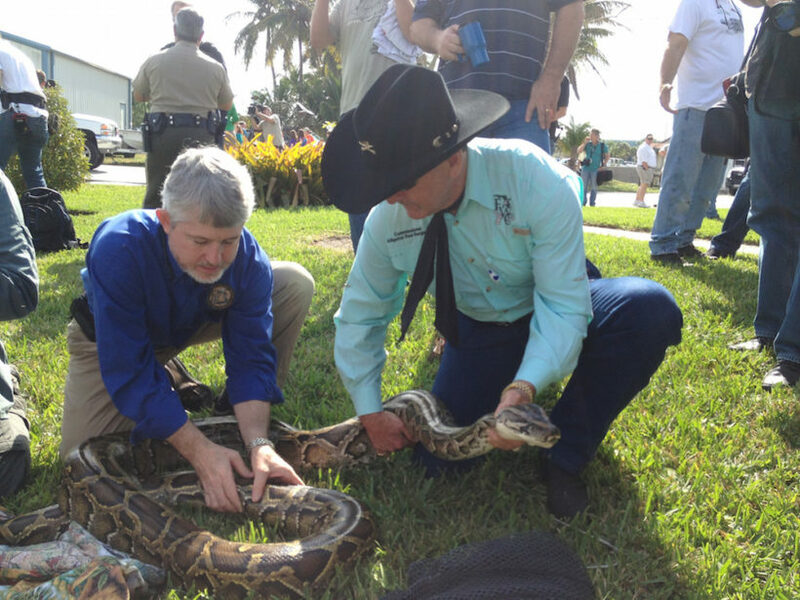 For help removing them, Florida’s Fish and Wildlife Officials started the “Python Challenge,” with a top prize of $5,000.